Few animals among Britain’s native wildlife are as endearing as otters. Following a period of serious decline between the 1950s and 1970s when the species was driven to near extinction in some areas, these water-dwelling mammals have made a comeback in every county in England and beyond. However, as with all mammals, otters are a notoriously skittish bunch. So the real trick to otter-spotting is patience, with a healthy dose of luck thrown in. Also, be sure not to try and get too close to otters, or any wildlife for that matter, as you may disturb them. Aughton Woods is situated near the River Lune, a well-known otter hotspot. The trick is to look carefully at the trail and pay particular attention to footprints; an otter’s footprints are usually asymmetric and often show only four toes instead of the five they have. Just don’t confuse otter footprints with mink prints, which are much smaller. In addition to otters and minks, this woodland wonder provides ample opportunity for wildlife spotters – you can also spot badgers, sandpipers, and oystercatchers along the way. Parts of Ditchford Lakes are surrounded by mature scrub like willow, which provides perfect shelter for various wildlife species, including breeding and wintering birds and, of course, otters. If you look hard enough you may be able to spot their footprints in the wet mud – a telltale sign of their presence. Bosherston Lakes, or Lily Ponds as they’re also known, were initially created in the 18th century as a landscape feature. Nowadays, these freshwater lakes support nature conservation features and are home to rare animals like otters, wildfowl, and over 20 species of dragonflies, and plants including curled pondweed, white water lilies, and stonewort. 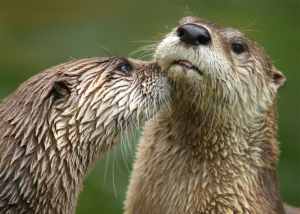 If you’re here to see otters, note that you’ll most likely catch them out and about in early morning. A 400-acre farmland, Gilfach Farm is a nature reserve in the heart of Wales. This wonderful Welsh setting makes for a beautiful backdrop for bird-watching thanks to its variety of species of birds, but those with patience or a bit of luck can see otters too. Perhaps the most foolproof location for otter-spotting is the Isle of Mull, where you can find these mammals just about everywhere! Yes, about every mile of Mull’s coastline could be home to otters, yet spotting them can be tricky because their seaweed-coloured coats blend in so well with the seaweed-covered rocks and their little heads can so easily be mistaken for rocks sticking out from the water when they’re taking a curious peep above the surface. You just have to look harder! See otters at Blue Reef Portsmouth today! Did you know that you could see otters at Blue Reef Portsmouth? Yes, you don’t need to go to the countryside to have a closer look at these fascinating creatures. Book your tickets now and enjoy up to 10% discount!